It's interesting to consider at what point in someone's career does he or she become a national treasure - as Alan Bennett once so scathingly remarked, “If you live to be 90 in England and can still eat a boiled egg they think you deserve the Nobel prize” - but there can surely be no debate about whether Dame Judi Dench deserves her status. Geoffrey Palmer said of his co-star for several years on the BBC sitcom As Time Goes By, “She's everything that everyone says about her” - and what they had to say about her in Charlie Stuart's The Many Faces of Dame Judi Dench was overwhelmingly nice; she's a joy to work with, a stellar presence on screen and stage, and a jolly presence in the rehearsal room. The film was an enjoyable, if undemanding run-through of Dame Judi's career and, although billed as a documentary, there was little by way of personal biography. For the record, she was born into a Quaker family in York in 1934 and made her professional debut in 1957 with the Old Vic Company and hasn't stopped working since. Palmer was among a long list of talking heads who included Michael Parkinson, Ronald Pickup and Simon Callow, and a smattering of critics, but she was noticeably absent from the programme, and the clips perforce were mostly of her television work and some recent films. Much was made of her wide range of credits as one might expect from an actress with an extensive and varied CV. Palmer, an old friend who made some drily mocking contributions, explained, “She just likes working, so if someone offers her a job, she takes it. She’s crazy." She has always, we learnt, moved with ease between stage, television and film, and - unusually for an acclaimed serious actor of her generation – has done as much popular entertainment as she has highbrow work, in a career dripping with awards, including an Oscar. Her longevity means that each generation discovers her for themselves; for many, she's the definitive Lady Macbeth (in Trevor Nunn's 1976 RSC production), or Sally Bowles (in the first London production of Cabaret in 1968), or Queen Victoria (in John Madden's film Mrs Brown, pictured right). To a huge number of TV viewers she will be known as the kindhearted Miss Matty in Cranford (pictured below), and to filmgoers for a heartbreaking study of the novelist Iris Murdoch descending into the hell of dementia in Iris (2001), or as the positively evil Barbara Covett tormenting fellow teacher Cate Blanchett in Notes on a Scandal (2006). For me her definitive role was Titania played as Gloriana in Peter Hall's magnificent production of A Midsummer's Night's Dream in 2010. It was, simply, awesome. 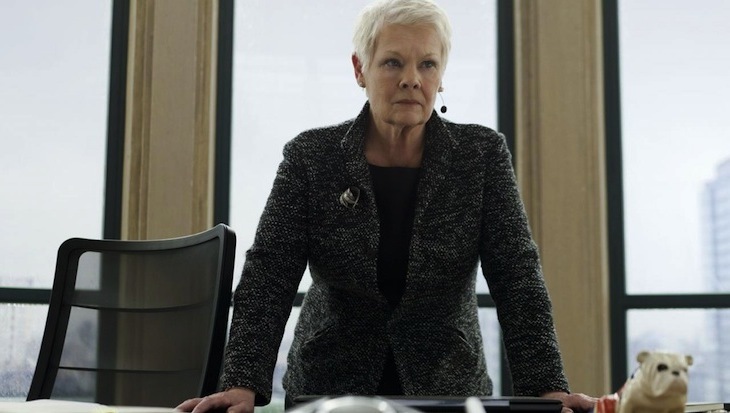 Despite being made in DBE in 1988, Dame Judi's fame was confined to these shores until a trio of roles in films released in three years – M in Goldeneye (1995), Queen Victoria in Mrs Brown (1997) and Queen Elizabeth I in Shakespeare in Love (1998) – gave her worldwide stardom. As her Goldeneye co-star Samantha Bond remarked, Dame Judi become an overnight success in her sixties in the United States and some American journalists, unfamiliar with her extensive CV, innocently asked what she had been doing before M. Dame Judi had been offered Broadway roles when she was younger, but decided to stay put in Britain to look after her beloved husband, the late Michael Williams (her co-star in the BBC sitcom A Fine Romance) and their daughter Finty Williams, herself now an actress. Much of Dame Judi's popularity, I suspect, comes from the fact that lots of TV viewers know her as a notorious corpser from her appearances on bloopers shows down the years - “We did have the odd retake...” attested Palmer - while director Sally Potter talked about the “weeping levels of hilarity” during the making of her film Rage (2009), when a young man had to be drafted in to tutor the dame in the art of smoking a spliff. Others may quibble with Dame Judi's recently elected status in a trade newspaper as the greatest stage actress of all time – surely an impossible thing to judge, and one that I suspect she herself would bat off as silly – but as this programme showed, she is head and shoulders above her peers in the breadth of her roles. She's done everything from Shakespeare to Sondheim, sitcom to Z-Cars and Bond to Brecht. And even at an age where others might be retiring she is still taking on demanding and boundary-pushing work, such as her role in the experimental film Rage. This was decent trot through an interesting and full career, and it was fun to see some footage of Dame Judi as a young actress. But ultimately her absence meant that the film lacked any meaningful analysis of her work.